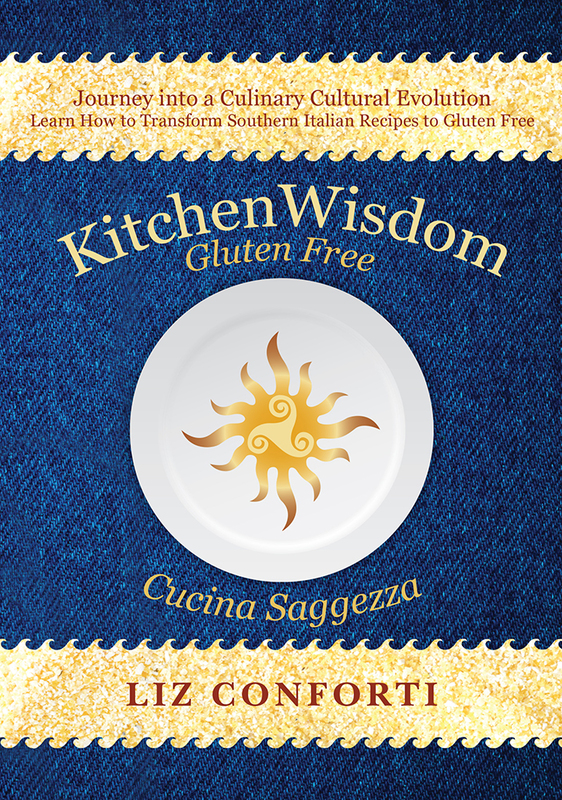 Kitchen Wisdom Gluten Free Scamorza Nibbles are so tasty; your guests will crave more! 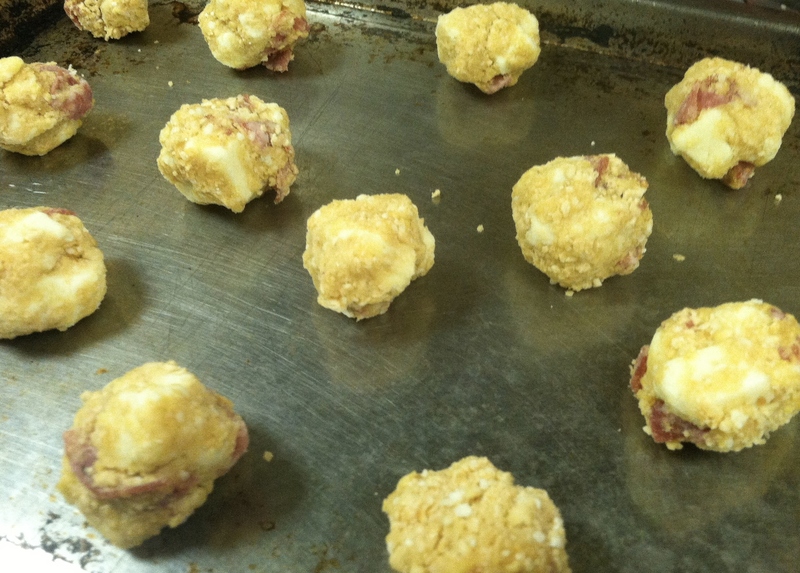 These morsels are easy to make and require only a few minutes prep time. Additionally, they can be effortlessly frozen prior to baking for future use. Scamorza is a Southern Italian cheese which is similar to, yet more flavorful than Mozzarella. **Scamorza and Mozzarella are made in a similar manner; however, Scamorza is then formed into a hanging ball and dried for a period of time. Each cheese has a comparable melting point and can be substituted for one another. 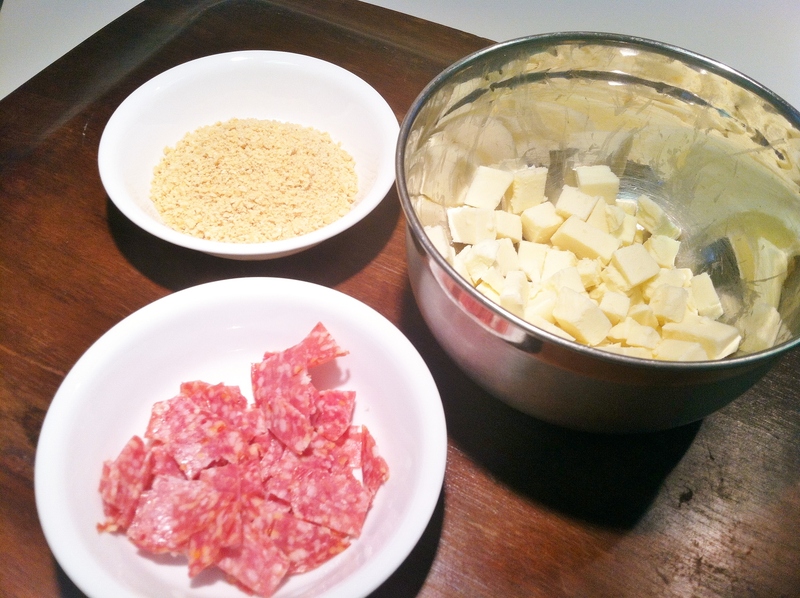 I use Salame in the recipe pictured, however any Italian dried meat will do. Living in northern Vermont leaves me few authentic and flavorful semi-dry Italian meat choices; so I often use a high quality and locally available Salame in my recipes. Buon Appetito! Cut cold Scamorza cheese into ¼” – ½” cubes, place in a mixing bowl. Slice Salame into small thin strips no bigger than ½”, then add the meat to the Scamorza and turn with your hands to combine. Mix in the grated cheese, followed by the egg. Sprinkle in the breadcrumb, and mix with hands making sure all of the ingredients are completely combined. Pre-heat oven to 450 degrees; pluck a tablespoon of mixture and use the palms of your hands to create a ball, the ball should be no bigger than 1 ½”. Place on an ungreased cookie sheet. At least 2 inches apart. Bake for 6-7 minutes, until the bottom begins to melt and small bubbles appear. Remove to a plate and serve – these nibbles are wonderful out of the oven or room temperature. 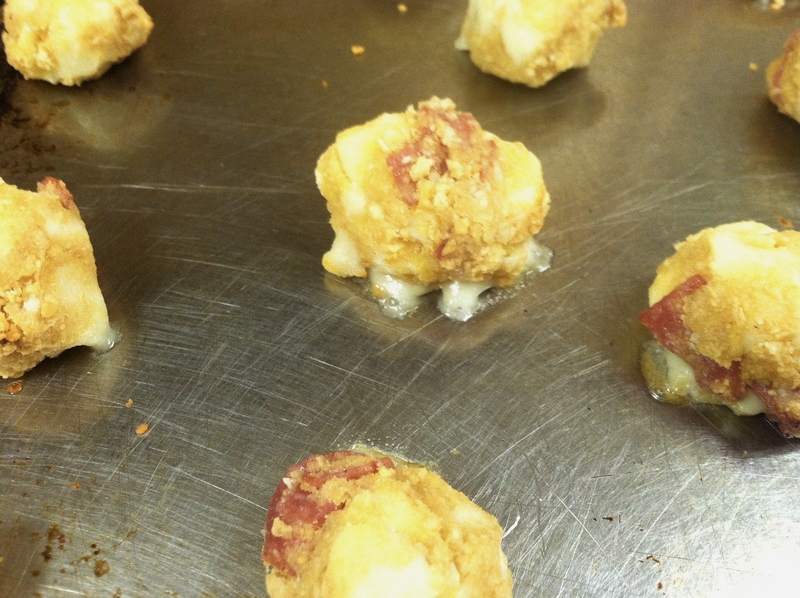 Tip: Prepare ahead of time and freeze the balls. Then remove from freezer, place on ungreased cookie sheet and bake for 15 minutes. **Cheese.com is a great site for helpful information regarding many types of international cheeses, boasting facts concerning 1400 specialty cheeses from 73 countries. I made these & they were yummy. Quick & easy too! I used mozzarella instead, since that was what I had available & they were a big hit! Thanks Donna! The picture on your BrooklynCooks facebook page looks delish! This entry was posted on January 26, 2015 by kitchenwisdom2013 in celiac disease, celiac recipe, forget what you know about wheat, gf appetizer, GF breadcrumbs, gf cooking, GF Ingredient, Gluten Free Appetizer, gluten free breadcrumbs, gluten free italian recipe, gluten intolerance, kitchen wisdom gluten free, NCGS, non celiac gluten sensitivity, ricetta senza glutine, scamorza nibbles gluten free and tagged appetizer, Breadcrumb, Meat, mozarella, nibbles, Pork, salame, salami, scamorza.